Transform your perceptions of Island hopping when you sail with Seabourn through Australia, New Zealand and Indonesia. Sail to Europe’s storied shores with Crystal’s collection of distinguished, all-inclusive ocean, yacht and river cruises. We’ll help you select the ideal accommodation for your authentic Switzerland experience, whether you’re in search of mountain hikes, lakeside views or a city stay. Experience close-to-nature encounters such as wildlife watching in the Swiss Alps. Head up to the Niederhorn in the Jungfrau Region with your local guide to observe local wildlife or follow your nose (and eyes) on a special guided city tour through Bern, Switzerland’s capital. Reserve with us and we’ll ensure you receive exclusive privileges including complimentary breakfast and upgrades whenever available, as well as special extras such as spa services and resort credit. With nature’s bounty on full display from your luxury guestroom and a world of activities within easy reach, this vacation promises to fulfill your mind, body and soul. 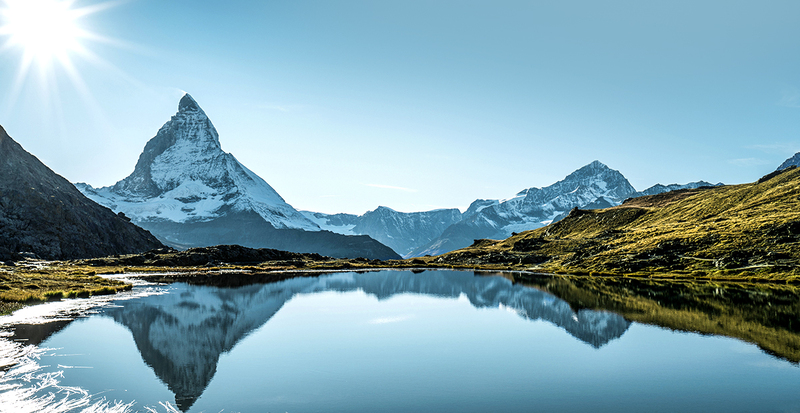 Pure alpine air and hundreds of miles of hiking and biking paths make Zermatt a paradise for outdoor enthusiasts. Whether you’re simply strolling through the car-free village or skiing in the height of summer at over 12,000 feet, begin each day refreshed from your night at Grand Hotel Zermatterhof. Revel in clear views of the mighty Matterhorn from your suite, and enjoy the flavors of the land at Prato Borni restaurant, featuring ingredients sourced from the mountains, streams and sunny valleys of Valais. The Rhine flows through the heart of Basel, enticing locals and travelers alike to plunge into its cool waters and relax on its banks. Experience the essence of this charming city from your riverfront suite at Grand Hotel Les Trois Rois or from the candlelit terrace of Cheval Blanc by Peter Knogl over a three-Michelin-starred meal. We’ll arrange your stay in Basel before or after your Rhine river cruise and create effortless excursions to nearby regions such as the majestic Jura mountains and the gleaming blue waters of Lake Lucerne. 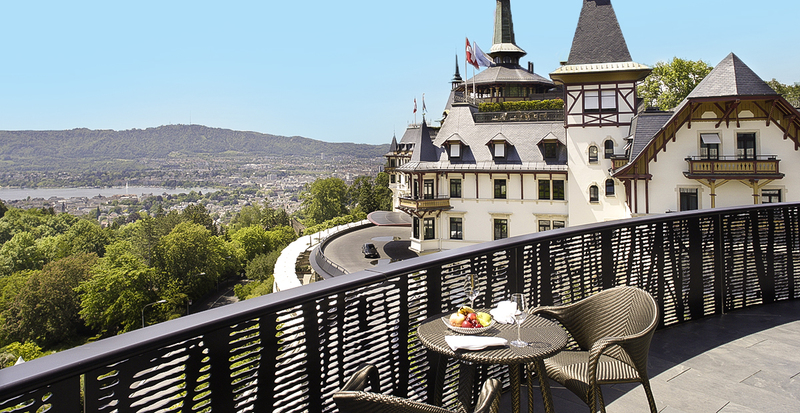 You’ll be surrounded by picture-perfect Swiss vistas from your perch atop a hill in castle-like The Dolder Grand. This enviable perspective reveals sweeping views of Zürich and its sparkling lake framed by the snow-capped peaks of the Alps. Nature is threaded throughout your stay, from the indulgent rainshower in your bathroom to an extensive menu of treatments in the 43,000-square-foot spa — we recommend a shiatsu massage enhanced by rhythmic tapping of bamboo. The crisp freshness of pure air envelopes you on a walk through the hotel’s impressive collection of outdoor installations, with more than 150 works of art gracing the property. Picturesque barely begins to describe the beauty of Interlaken, the famed resort town in the Bernese Oberland region tucked in the mountainous heart of Switzerland. Two shimmering lakes and the snowy peaks of the Jungfrau Region are your personal playgrounds when you stay at VICTORIA-JUNGFRAU Grand Hotel & Spa, and we’ll arrange every excursion from high adventure to leisurely pursuits. 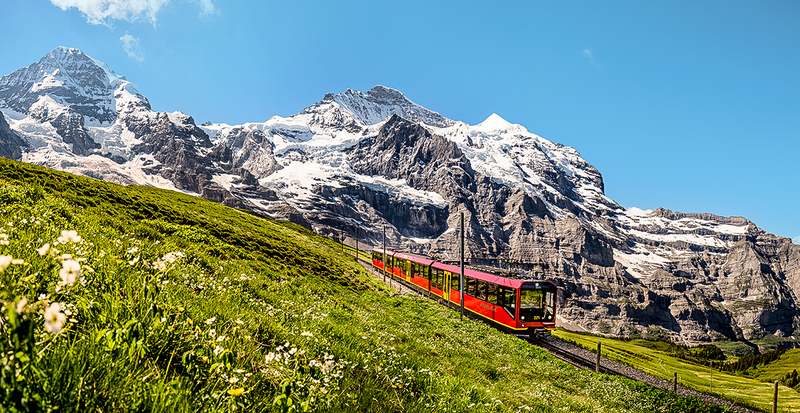 Ride to the highest railway station in Europe, the Junfraujoch - Top of Europe, to enjoy breathtaking views over Swiss alpine peaks and the Aletsch Glacier and sample celestial sweets at Lindt Swiss Chocolate Heaven at 11,371 feet above sea level. Ready to escape to the Swiss mountains? Contact us today to find your ideal stay.